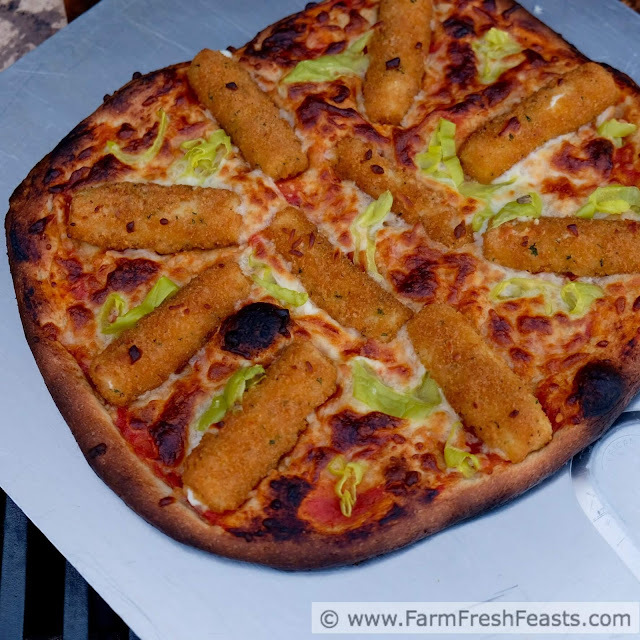 This pizza has mozzarella sticks and pickled peppers for a gooey cheesy pie with a bit of a kick. Throw a few handy toppings on a pizza, then throw it on the grill for a fast, easy, and cheesy meal. I don't wish to give the impression that everything I make is healthy. What is "healthy" anyway? Different people define it in different ways, and I'm sure not about to tell you how you should define healthy. 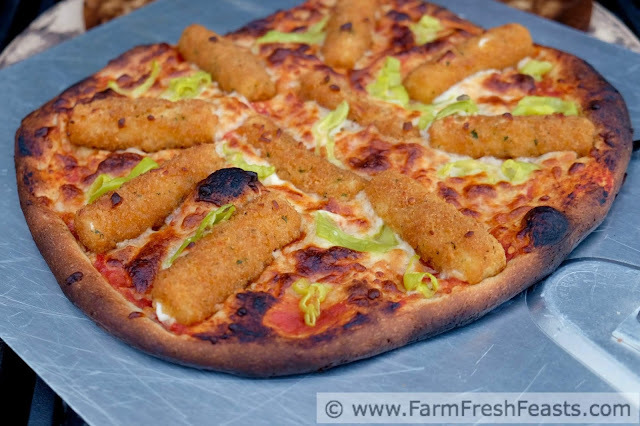 I'm here to offer choices in how you can eat the foods produced in your local area, and if that means putting them on a pizza--I'm all for that. My family loves to eat pizzas and watch a movie on Friday nights. Most of the time I make the pizza, as I can fire up the grill, stretch out the dough, make the pizzas, and be finished within 30 minutes. And I'm slow in the kitchen! No need to call for delivery if I've got all the supplies at home. Unless, of course, my kitchen has been taken over with the 4 hour installation of a new dishwasher, as happened recently. I shared the photo on my Instagram feed, in lieu of an 'as it happens' pizza photo/video. In that circumstance I called for delivery and tossed the boxes in the oven. When the dishwasher was finally set up, we sat down to pizza. This pizza came about because my daughter and I went shopping when we were hungry. We bought a giant box of mozzarella sticks. I do not believe there were hundreds of sticks but at one point it seemed like it. 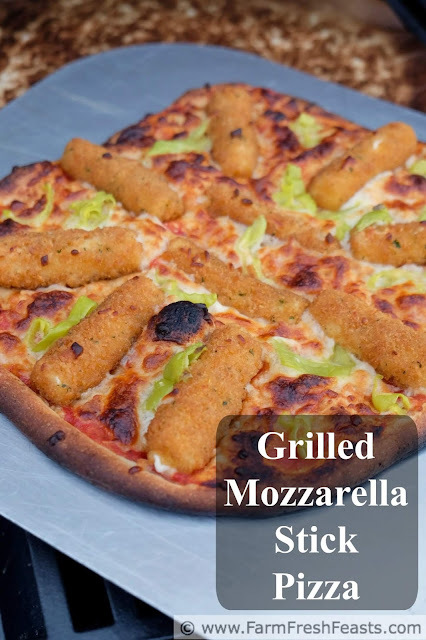 If mozzarella is good on a pizza, why not a mozzarella stick? I try and include vegetables in pizza as often as I can, so I grabbed a jar of pickled peppers from the fridge and tossed a few in between the mozzarella sticks. They provided a nice contrast to the gooey cheese oozing out of the crunchy breaded shells. Side note for gardeners--after a couple of unsuccessful years attempting to grow enough banana peppers to pickle some, I had a banner year last year. Pickling peppers is as easy as boiling water, and I put up so many jars that we're set for this year. I'm turning my sights on cucumber pickles and salsa verde, and just planted a bunch of pickling cukes and tomatillos. Wish me luck. For more pizza ideas, please see my Visual Pizza Recipe Index. For more recipes using peppers, please see my Pepper Recipes Collection. It's part of the Visual Recipe Index by Ingredient, a resource for folks like me eating from the farm share, the farmer's market, the garden, the neighbor's garden, and great deals on ugly produce at the grocery store. Preheat a gas grill by turning all burners onto full power, closing the lid, and leaving it alone while you go fuss with the pizza dough. I won a pizza grill stone (Amazon affiliate link) and I preheat that at the same time as the grill. Using the stone means that I don't need to 'work quickly to avoid sticking' nor does my nicely rounded pizza ever change shape into a distorted blob. I really recommend using a stone if you plan to grill pizza and if you're not the fastest flipper at the grill. On an oiled piece of parchment paper, again, a way to ensure that my final product is similar in shape to what I started with, stretch out the dough into the shape it wants to be today. Brush the edges of the crust with olive oil. Spread sauce evenly over top of the dough. 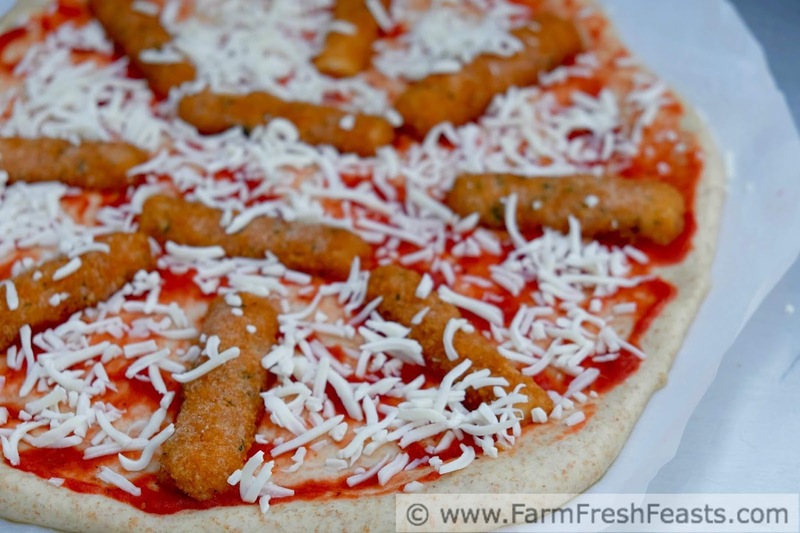 Place the mozzarella sticks in a pleasing pattern on top of the sauce. 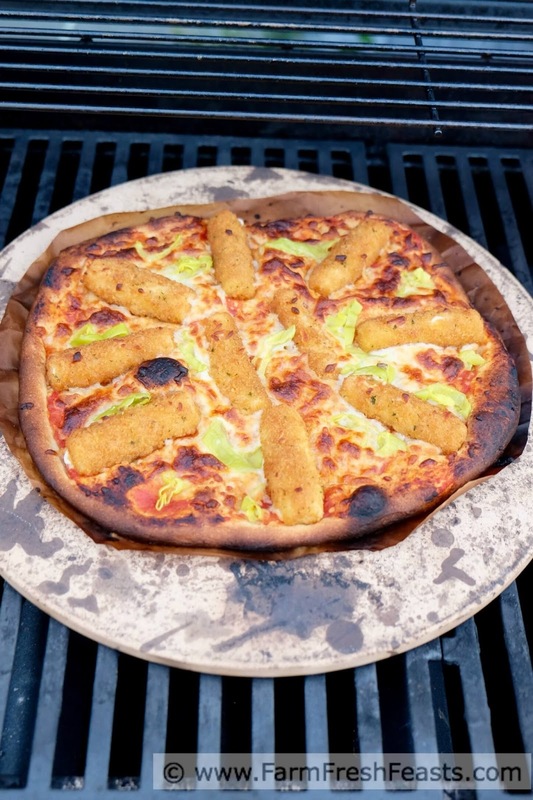 Scatter the cheese and pickled peppers on top of the mozzarella sticks. By now, the grill ought to be good and hot. Mine has a thermometer in the lid, for what that's worth, and it usually reads 500-550 degrees Fahrenheit by the time I get back out. Slide the parchment paper + pizza onto a cookie sheet or pizza peel, then slide it off, parchment paper and all, onto the preheated pizza stone. Easy peasy, right? No fancy wrist work needed. Close the grill and spend 5 minutes cleaning up the kitchen or chatting with a neighbor or drinking a beer and enjoying the outdoors. Check the pizza after 5 minutes--is the crust browned to your satisfaction? The cheese browned and bubbly? If so, grab that cookie sheet or pizza peel and slide the whole thing back out. (If not, close the lid for another minute or two). Let the pizza rest on a rack for a few moments, without the parchment paper underneath, before slicing and serving. Which I did not get a picture of. We just ate it. Terrible way to entice you to eat a pizza, I know, but it's easy and it's good so try it if you, too, bought way too many mozzarella sticks.